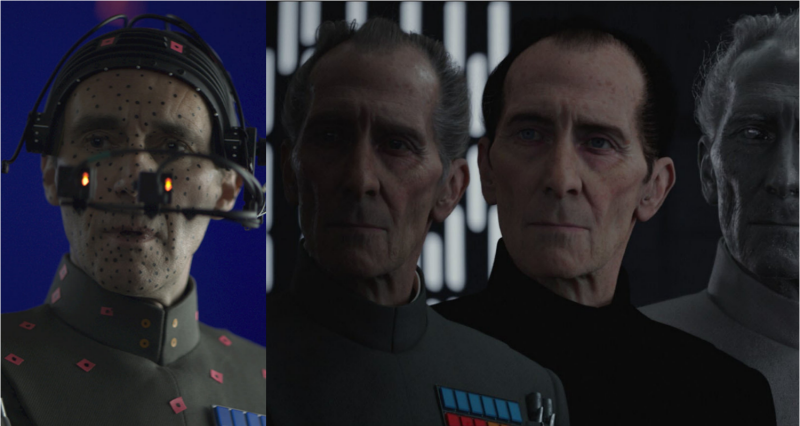 This is one of the reasons why I have no problem with cinematically bringing Tarkin back to life for Rogue One, because the character’s behavior was exactly consistent. But how did they do what even ILM called “one of the most complex and costly CGI recreations ever?” That’s where things get interesting. This isn’t really the first time we’ve seen this either. We’ve seen filmmakers make Brad Pitt look younger and older in Benjamin Button (2007), Robert Downey Jr. go back decades in Captain America: Civil War (2016), and even Sir Patrick Stewart and Sir Ian McKellan looked many years younger in X-Men: The Last Stand (2006). But all three are very much alive. For Tarkin, it was going to be touchy because Cushing had died in 1994. Furious 7 broke serious ground on this concept with a final goodbye to Paul Walker, who had died in the middle of production. But before that, it was only used to put actors like Fred Astaire and Marilyn Monroe in TV commercials or Bogart in an episode of Tales From The Crypt. With Furious 7, they wanted to give an emotional goodbye to Walker and his character, and they were able to, thanks to using his brothers as stand-ins for the late actor and the required VFX. Visual Effects maestros had to find someone with a similar facial bone structure to Cushing, much like the VFX wizards did with Walker via his brothers. 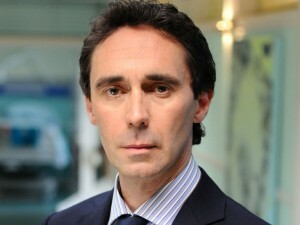 That’s where British actor Guy Henry (Harry Potter and the Deathly Hallows) came in. They then had to actually overlaying Cushing’s likeness onto Henry’s face for the CGI recreation in Rogue One. Cushing was shot almost completely from the waist up for his performance as Tarkin in the original Star Wars, because Cushing hated having to wear the knee high cavalry boots that were a part of his costume. Eventually, director Lucas relented from all Cushing’s complaining and allowed him to wear bedroom slippers (I love that dichotomy, a man who ordered the destruction of a planet wearing his slippers!). Lucas just shot him from the waste up or behind furniture. But that presented it’s own problems: There were’t any full body shots of Cushing as Tarkin. Disney had to find other performances over the course of Cushing’s career, which included his work as Sherlock Holmes and in numerous horror films in order to get his gait as he walked around, how he stood, and so on. The result was going through these hours of footage and create a proper 3D model of Cushing, and then combining it with Guy Henry’s performance to bring Tarkin back from the cinematic grave. Some think that this is akin to stealing or exploiting an actor without their consent or payment, but a California State Law was passed years ago that requires permission from a deceased actor’s estate for up to 70 years after death. SPOILER ALERT if you haven’t seen Rogue One!! They had no problems creating a young Princess Leia for the final shot, because actress Carrie Fisher was alive at the time. Should Disney need to portray a young Leia for Episode IX, which I pray they don’t, that law would now come into effect with her passing. But Rogue One Visual Effects supervisor John Knoll (who actually pitched Rogue One to Lucasfilm) thinks the cause for concern is much ado about nothing. He’s rather doubtful this technique will become the norm in Hollywood. To tell you the truth, I didn’t mind it at all. The portrayal of Tarkin, which was actually quite technically impressive, didn’t change the character in anyway, nor how Cushing portrayed him. And some say it was the best acting in the film for a man who’s been gone for 20 years. But Knoll has a point, creating a performance from a deceased actor is far too labor intensive and expensive for budget-conscious productions to undertake, just because you can. But Rogue One simply couldn’t have Tarkin there, since it would make his presence in the original film out of nowhere (barring a hologram, as some have suggested). He needed context, and to recast him, as Lucas did for a brief appearance in Episode III: Revenge of the Sith, was rather lacking (see left). Sure you could have had Henry just play the role with makeup effects and some CGI enhancements, but it would be fooling nobody. Tarkin’s shadow casts across the Galaxy from the Death Star in the film. He HAD to be there.